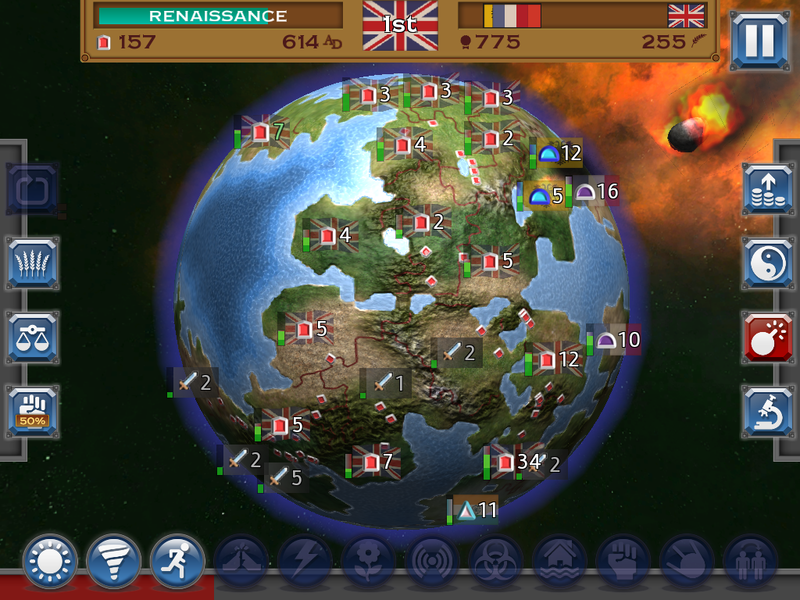 It’s been 8 months since we released our first iOS title Rapture – World Conquest. It’s been a roller-coaster of a ride – mostly consisting of a big steady climb at the start, a sharp plunge and then a long graceful slide. We’ve learnt an awful lot and I wanted to share a few thoughts on our experiences. Tundra Games consists of myself (Dan Collier) and the other co-founder Andrew Weinkove. We both started in games many moons ago and worked together at Exient in Oxford. Andy and I have been in the games industry a while and have worked on many mainstream titles, mostly on handheld and like a lot of seasoned games developers we wanted more creative control over the games we were making. So we decided to set up Tundra and started developing our own. 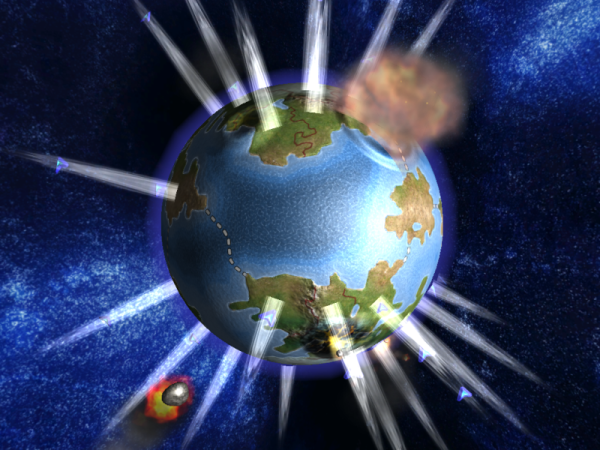 Andy originally came up with the concept of Rapture while thinking about two of his all-time favourite games, Civilization and Counter-Strike. The idea was to explore what would happen if the rapid five minute rounds of Counter-Strike were transplanted into the majestic historical sweep of Civilization. Rapture – World Conquest is a god game where you control your followers and attack your enemies. You build up your forces and try to take over as many regions as you can before the End of Times arrives. You also have various miracles you can use along the bottom; Meteors, Earthquakes, Tsunamis etc. All in all the game took about 2 1/2 years to write, it was mostly written evenings and weekends. This was about 6 months over our self-imposed deadline, but when there’s no publisher breathing down your neck it’s easily done. By holding paying jobs we have been able to finance ourselves without any outside help. We kept costs minimal – the main one being the graphics, where we spent money on some decent 2D artwork. It’s been slow steady development with low risk. We also tried to keep feature creep to a minimum. We released the game mid-September 2014 for iOS. The game has been on the App Store for 8 months now. It was priced at $2.99/£2.29. The game has in-app purchases, which consist of coin packs to buy various upgrades in the shop and also a doubler, which doubles the amount of coins you earn in game. 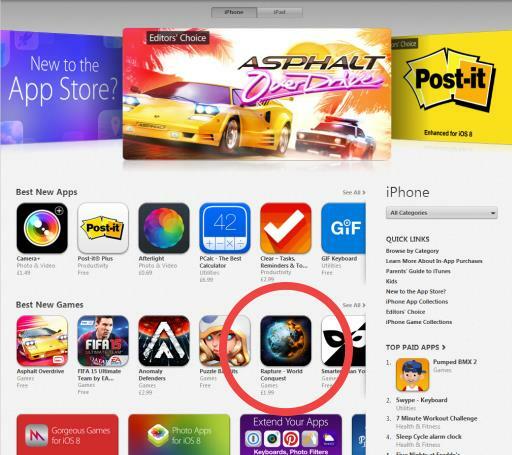 Just after initial release in September we managed to get featured by Apple. As any developer will tell you this is about the best thing that can happen to an iOS game. The first week it was featured on the US store and we peaked at 750 downloads in a day. I’m not sure how we got featured, it came out of the blue. The second week we were featured in most of the rest of the world. This second feature may have been through emailing Apple to point out that we were featured on the US store and us asking about other stores, but to be honest we might have been featured anyway. That second week we managed to peak at 1100 downloads in a day. This was a really wonderful start for us and we were ecstatic. Overall we managed to get into the top 10 paid strategy charts in over 40 countries, including the US, Canada, UK, Russia, Japan and China. Though this didn’t seem to affect downloads as much as we expected. We also got a number of great user reviews and emails from people. Players seemed to like it and found it fun, which is the one of the reasons we wanted to create games, and the great thing about going indie is that you have direct contact with fans. There were however a number of negative user reviews and some online comments and I’ll admit it can hit you quite hard, especially if you’re not used to it. It’s easy to focus on the negative, and a lot of our negative comments centred around our IAPs. We added IAPs as we’d seen them in a number of paid games – seeing them as a way of generating a little extra revenue. I’ve always seen IAPs as a sort of cheat – for players who want to move ahead faster than normal; see extra content early before unlocking it in the normal way. However several users felt the IAPs were cynically added – given that they had already bought the game, they thought it greedy to then ask for more money in game. We would have priced our shop items the same whether or not the IAPs existed, but the trust of your customers is a fragile, easily damaged thing, and we should have been more mindful of that before adding IAPs. As you can see, the revenue from IAPs is dwarfed by the revenue from game purchases. However, this is to be expected from a paid title which does not aggressively push its IAPs. If anything we were surprised that they were as high as 6% of total revenue. We speculate that the effect of the negative App Store reviews that resulted from the inclusion of IAPs probably outweighed their revenue. Once the feature and the initial euphoria had disappeared and we realised we weren’t going to be zillionaires, we settled down and looked at what we wanted to do next. Not having the game localized into some languages had prevented us getting featured in those countries. We decided to quickly translate the game in French, German and Spanish and see if we hadn’t missed the boat. A month later we updated the game, but unfortunately Apple didn’t feature us and the translations didn’t seem to help downloads in those territories. The feature aside, one of the main areas we lacked (and still do) as indie dev newbies is any method to publicise ourselves. On release we emailed everyone and anyone that might be interested. We did manage to get a few reviews from big sites, but generally it was hard to get a response from journalists. This is doubly true, once the game is already out, journalists are much less inclined to comment on an update. In November we went along to Apps World at the London eXcel. It was a great couple of days. We showed off the game to countless people and journalists and met and chatted with lots of fellow developers. I managed a stuttering panel talk about Rapture and had a go at the Pocket Gamer Big Pitch. All good fun, but the event didn’t graze our download graph. Even a 4-star review from the major website 148apps in November made no noticeable impact on our downloads. In March we released our second big update – adding Multiplayer to the game. We weren’t expecting a huge response to MP, it was more for our own satisfaction as the game had always been envisioned as having an online mode and had been engineered from the start to support it. We combined this with a price reduction to $0.79/£0.79 and managed a modest jump – 250 downloads in one day, but quickly dropped back down. It’s hard to know how many of those downloads were based on the price change and how many on the new game mode. We always knew we’d struggle to reach the minimum viable population to sustain a multiplayer community but we have been particularly disappointed by the numbers of multiplayer games being played. According to our analytics, less than 100 multiplayer games have been completed, which is a very poor result considering the massive effort it required. Costs include art work, localisation, visits to a couple of conferences, website/server hosting and some small experiments with advertising. They do not include anything for the time invested by me or Andy. So this week we’ve released another big update – we’ve made the game free. The game now has incentivized video adverts and post-game interstitial adverts joining the existing IAPs. Existing users automatically receive the game’s VIP pack which gives them a few new extras and disables their adverts. We’re treading carefully – not wanting to upset existing players that have paid. We really appreciate their support in this respect. As classic gamers the idea of free games is fairly alien. We toyed with the idea of going F2P whilst writing the game, but veered away. Possibly the IAPs were a compromise in this respect, but in hindsight perhaps we should have gone one way or the other. However, in switching to free we’ve steered clear of banner adverts and energy/timer mechanics as we feel they’re the mechanisms which most damage our enjoyment of games. It will be interesting to see how the game fares now, whether we get a reasonable number of downloads, some decent reviews and hopefully a little extra revenue. At the very least, it’ll be nice to have our game played by a lot more people and maybe we’ll even manage to sustain a reasonable multiplayer population. Once we see how the game does as a free title we’re considering a possible Android version of the game. We’re also thinking about removing the ads and IAPs and creating a Steam version for Windows/OSX. Plus we have lots of ideas for a sequel and new game ideas we’d like to explore. Tundra Games is an independent game studio based in Oxford & Colchester UK. It was founded in November 2013 by industry veterans Andrew Weinkove and Daniel Collier. We have worked on many AAA titles including Skate It, Sims 3, FIFA, Madden, Angry Birds Star Wars, Angry Birds Go and Need for Speed. We have worked for companies such as Exient, First Touch Games and Rebellion. Please contact Dan for further details at dan.c@tundragames.com. Our game trailer can be found here: https://www.youtube.com/watch?v=8ZAEmztaUqs with further details and screenshots via our website – www.tundragames.com. As you would have spotted from the name, I am Andy’s dad. Of course I have bought your game, though I don’t play it. What parents have to do for our kids. Still I am delighted with any positive reviews you get. I am writing to applaud your honest description of the work you have put in and the poor rewards you get for your industry. You both love the gaming industry and will be eventually appreciated. Thanks Cyril, appreciate your comment. Andy and I love making games and that’s what it’s all about. As long as people enjoy our games, we’ll keep making them. Thanks James. Appreciate the comment and very good luck with your own game. Will take a look. That game looks amazing, I am in awe of the execution. Get it on Steam, their players have taste.